Medical Device companies are drivers of economic activity in the Minneapolis/St. Paul metro area and Interrad Medical is a member of that community. An illustration of the SecurAcath anchored just beneath the skin. 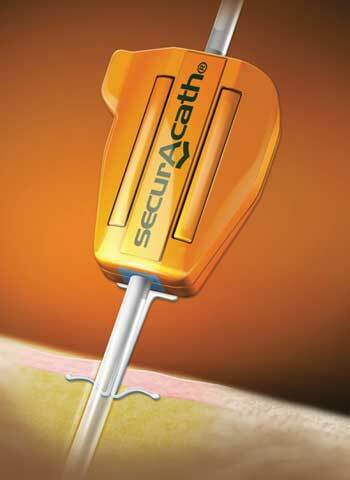 Interrad developed the SecurAcath®, a subcutaneous catheter securement device that utilizes a small anchor placed just beneath the skin in the subcutaneous tissue. The device is attached to the catheter at the insertion site – eliminating the need for adhesive devices or sutures. One of the important parts of Interrad’s design workflow is testing different versions of products before manufacture. Part of that process entails creating testing fixtures. These fixtures either hold or interact with the product in some way. For example, an important feature of the SecurAcath is the amount of pressure needed to “snap” it together after it has been wrapped around a catheter. To test the uniformity of pressure, testing fixtures needed to be created to hold the SecurAcath in place on the test bed. Another fixture had to be designed to simulate a human’s finger closing the SecurAcath around the catheter.